Get needed relief when working out, hot summer days, or when you just need to cool off with this Microfiber Cooling Sport Towel! Made from light, quick-dry fabric, this cooling towel is specially designed to wick sweat, accelerate drying, and promote evaporation. Helping to cool your body while playing sports, exercising, hiking, jogging, fishing, and just about any other outdoor summer activity, the Microfiber Cooling Towel is also ideal for any high-temperature work environment or as a first aid application for migraines, bee stings, sprains, etc. 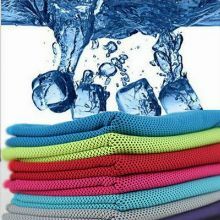 The Microfiber Cooling Towel comes in a variety of vibrant colors and measures a travel friendly 75*35cm. 1. Soak in cold water. 3. Shake a few times.